Last week, I got to be part of a huge moment in my baby brothers life. The same baby brother I have fought with, yelled at, and gotten in trouble with is no longer the long haired hoodlum he was when we were kids. He's grown up into a kind, generous, headstrong man. About a year ago, he told us he wanted to join the Air Force. We were all kind of stunned, since it was the first time he had expressed any interest in the military as a career. The field he wants to go into is highly specialized, and just to get in requires passing an insane physical test. Well, if there's one thing I know about my brother, it's that once he makes his mind up about something, he goes for it wholeheartedly. He immediately started training for the test, and put things in motion to join the Air Force. He's had some hiccups along the way, but that's never deterred him from his goal. 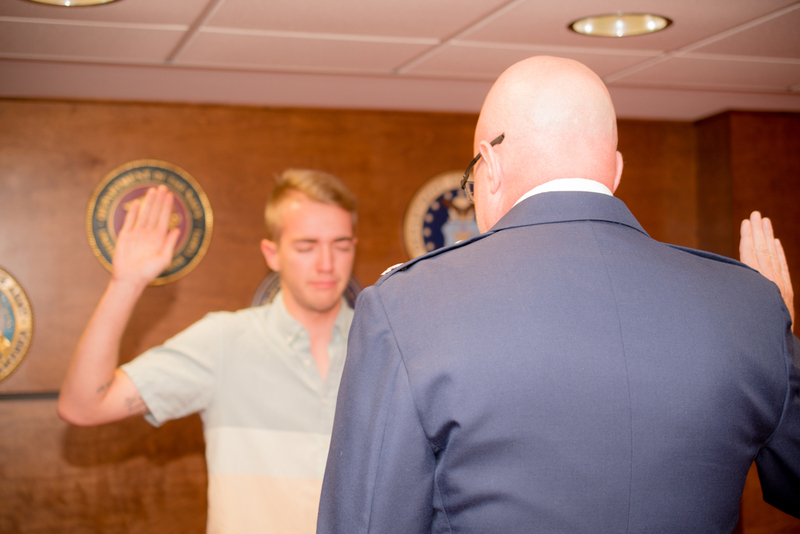 Last Tuesday, I got to be present while he was sworn in to the United States Air Force. This moment was made even more special by the fact that my father, a retired Air Force Lt. Col, was the one who got to swear him in, almost 35 years to the day after he first started his journey in the Air Force. My dad and my brother have always butted heads (if you ask me it's because they're too much alike, but neither of them will admit to that) but watching their relationship change and grow as my father has mentored Cory in this journey has been awesome. I have been blessed with the best family ever, hands down. It was an incredibly emotional day, but it was so wonderful to get to share this with my family.